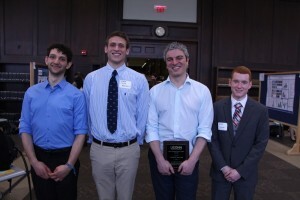 In recognition of the pivotal role that mentors play in supporting undergraduate research and creative activity, the Office of Undergraduate Research introduced the Mentorship Excellence Awards this year. These awards recognize one faculty member and one graduate student who exemplify the ways in which outstanding mentors challenge and support their students, enabling them to take intellectual risks and achieve milestones they might not have initially envisioned being able to reach. 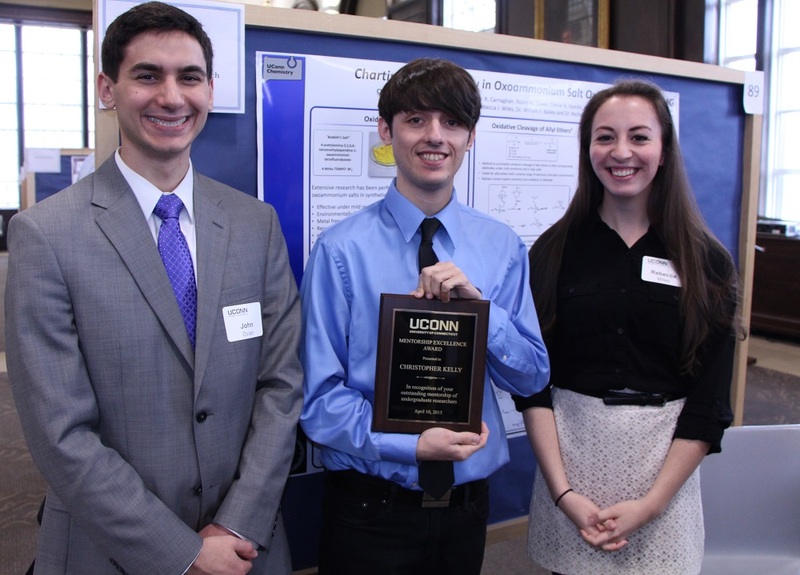 The 2015 Mentorship Excellence Awards were presented to George Bollas and Christopher Kelly during the Frontiers in Undergraduate Research Poster Exhibition on Friday, April 10, 2015. Professor Bollas’ award was presented by Ari Fischer ’15 (ENG), one of several undergraduate researchers in the Bollas lab. The following text is excerpted from Ari’s presentation remarks. Ari Fischer, Oscar Nordness, Mentorship Excellence Award winner George Bollas, and Clarke Palmer. I have been fortunate to work under the guidance of Dr. Bollas since my freshman year. Since that time, I have admired and learned from Dr. Bollas’ exceptional engineering ability and work ethic. Dr. Bollas has the ability to make what seems to be impossible happen. He has motivated and empowered us undergraduates to surpass our coursework and seize remarkable opportunities. Over the past three years, Dr. Bollas has sponsored undergraduate researchers to present at the American Institute of Chemical Engineering Research Conference in both the undergraduate poster session and oral presentations, where his students received numerous awards. In preparation for these conferences, Dr. Bollas revised dozens of drafts of posters and provided feedback on practice presentations. In addition, Dr. Bollas has challenged us to strive in our academic and career aspirations. From my experience, Dr. Bollas showed the same attention and commitment to my research as his graduate students’, helping to formulate my work into a paper for publication. At first, I could not have dreamed of publishing my work as a first author in a peer reviewed journal, yet with Dr. Bollas’ patience, determination, and guidance, I was able to do so. Dr. Bollas’ impact has not been limited to the few lucky to work in his lab, but extends to all of his students. He is constantly pushing the limits of our education and challenging us to take the lead in our work. In this way, he compels us to exceed the conventional undergraduate education. Christopher Kelly was nominated by Rebecca Wiles, one of the undergraduate researchers he has mentored in the Leadbeater Research Group. The following text is excerpted from the remarks shared by OUR Peer Research Ambassador Giorgina Paiella during the award presentation. John Ovian, Mentorship Excellence Award winner Christopher Kelly, and Rebecca Wiles. Chris is a graduate student mentor who has guided undergraduates’ “journeys from new researchers to confident and competent research chemists,” to borrow the phrasing of his nominator, Rebecca Wiles. His mentorship of undergraduate researchers is notable for its comprehensiveness as well as its inclusivity, with Chris often mentoring several students in a given semester. Chris has guided undergraduate researchers through the development of novel synthetic chemistry methods, findings that are subsequently published in peer-reviewed journals. In addition to offering support at the lab bench and in the process of academic writing, Chris has helped his mentees develop presentation skills in advance of the American Chemical Society’s Annual Meeting. Rebecca reports that it was Chris’ constant advising, teaching, and confidence in her that contributed to her success in presenting her research at the conference. This holistic attention to students’ development as both researchers and scholars is the hallmark of outstanding mentorship. Chris serves as a role model of a successful scientist, demonstrating to students how to cultivate and maintain relationships with mentors, balance multiple projects simultaneously, and handle the inevitable ups and downs of research. By encouraging students to reframe the failures inherent to the research process as valuable opportunities to explore new directions and approaches, Chris helps his mentees become more resilient and confident researchers eager to continue their research in graduate school and beyond. Congratulations to the 2015 award recipients! The Office of Undergraduate Research thanks the undergraduate students who nominated their faculty and graduate student mentors as well as the Peer Research Ambassadors who served on this year’s selection committee.